Gilbert Ryle was one of the most important and controversial philosophers of the Twentieth century. 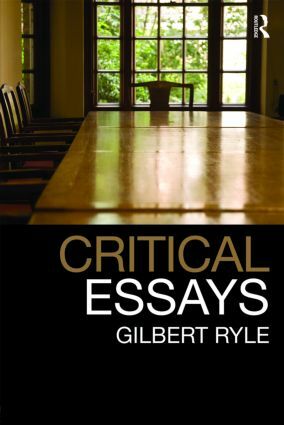 Long unavailable, Critical Essays: Collected Papers Volume 1 includes many of Ryle’s most important and thought-provoking papers. This volume contains 20 critical essays on the history of philosophy, with writing on Plato, Locke and Hume as well as important chapters on Russell and Wittgenstein. It also includes three essays on phenomenology, including Ryle’s famous review of Martin Heidegger’s Being and Time first published in 1928. Although Ryle believed phenomenology ‘will end in self-ruinous subjectivism or in a windy mysticism’ his review also acknowledged that Heidegger was a thinker of great originality and importance. While surveying the developments in the philosophy of language and philosophical logic, Ryle sets out his own conception of the philosophers’ role against that of his predecessors and contemporaries. Together with the second volume of Ryle’s collected papers Collected Papers Volume 2 and the new edition of The Concept of Mind, all published by Routledge, these outstanding essays represent the very best of Ryle’s work. Each volume contains a substantial introduction by Julia Tanney, and both are essential reading for any student of twentieth-century philosophies of mind and language.